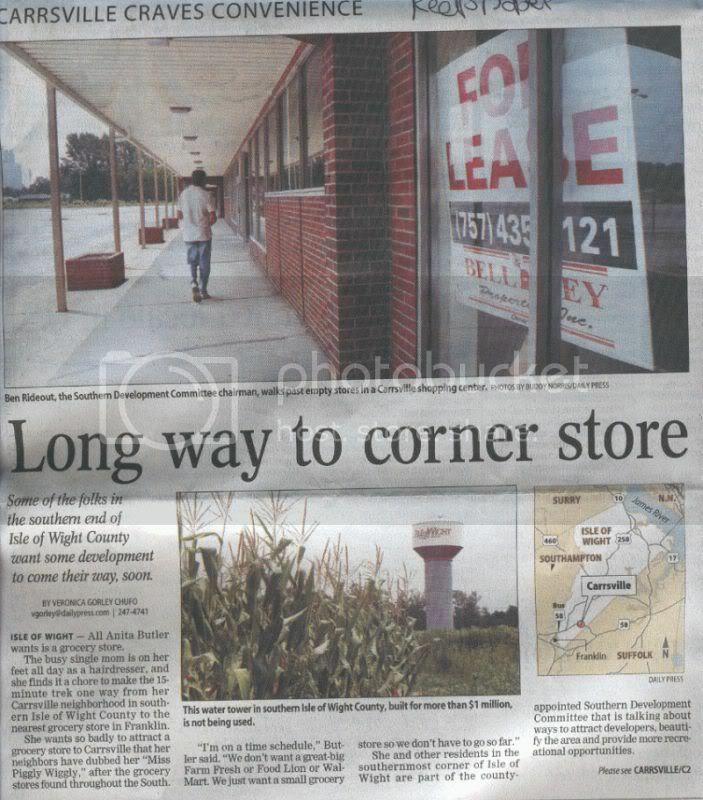 July | 2006 | That Mall is sick and that Store is dead! 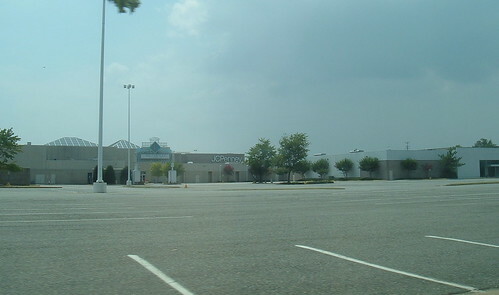 So I probably took my last trip ever to Coliseum Mall in Hampton today. Mom and I needed our eyes examined and Lens Crafters is one of the places our insurance lets us go to. So we drove all the way there. I didn’t need new lenses (that was surprising) and nothing was wrong with my eyes, but she did tell me to stop sitting in front of the computer all the time. Mom was there for-EVER though. ‘Cause she needed new lesnses, new frames, everything. So I went to Lane Bryant, returned a skirt, tried some clothes on (it feels good to have money again) but all I bought was a blouse. And then I went to Barnes and Noble and I bought a Moleskine Plain Reporter. And I had a Green Tea Frappichino (the ONLY Frappichino I will drink, other than those ones you buy at the store) and an icky sugar cookie while I waited, and waited and waited for mom. Oh, but before I got to B&N, there is a display a little mock up display of what Coliseum Mall is going to look like a few years when the tear parts of the mall down and it will look like a downtown shopping area. So I saw this older couple looking at the display and they were reaidng the fake stores in the display. They actually believed that stores like “Bookstation” and “Pillows Galore” was going to be in this new setup for the Hampton Town center whatever its going to be called. Hecht’s/Macy’s* is pretty much dead. I saw a poster to sign up for a Macy’s charge card. The store was totally empty. Just like 10 shoppers and a few workers. Maybe two people getting off the esclator. I got a cell phone call so I left the store and didn’t get a chance to go back in and take another look. *you know, I like the way that sounds, “Hecht’s-Macy’s”. I know Macy’s tried doing that a few years ago with some stores they bought (like “Rich’s-Macy’s” and “Bon-Macy’s”) but it didn’t turn out. I didn’t go to Penneys, but it seemed to be doing briskly like it always does. I was afraid to go into Burlington Coat Factory and Steve and Barry’s. While mom and I were waiting for LensCrafters to make her glasses, we went back to B&N and I was at the cafe getting an Italian Soda and these two “pretentious” people (I didn’t know they still existed in Hampton!) were ahead of me and one guy was a stocky, early 50’s guy and he had one of those trillion dollar digital SLR cameras pasted to his side (I wonder if he went around the mall with that thing pasted to his side, I’m sure security would’ve stopped him in a Don Johnson Heartbeat) Anyways, he was talking to the pretentious lady and she was whining about how her roomate or friend or something had a family member die last night and she was up until like 3 in the morning with her. And she said, “you know, we did the drinking, watching cheesy old movies kind of thing”. It just sounded so fake. Like something you’d hear on a TV show or a paperback. It felt like a breath of fresh air when we drove into Franklin. 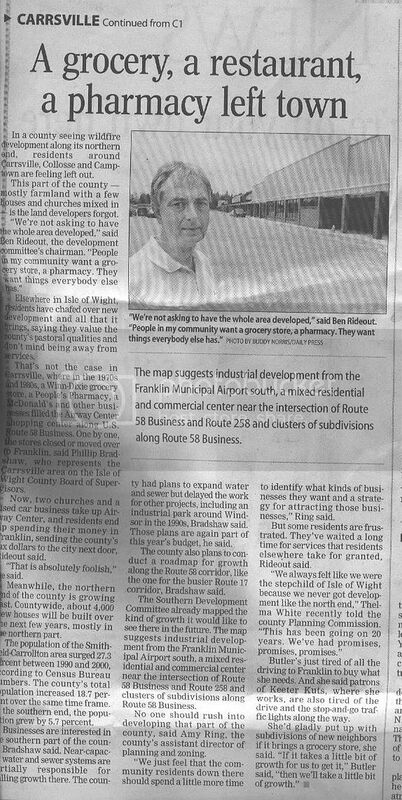 "In southern Isle of Wight, some dream of a grocery"
My newspaper ran an article about the empty Airway Center in Franklin a few days ago. I found this Ohio paper from 1982 in my dad’s office. I know where it came from. It was my parents first Christmas together and they went to Ohio to see my dad’s parents. My mom was pregnant with me. My dad must of brought this newspaper back home with him. I believe the date was December 17th, 1982. 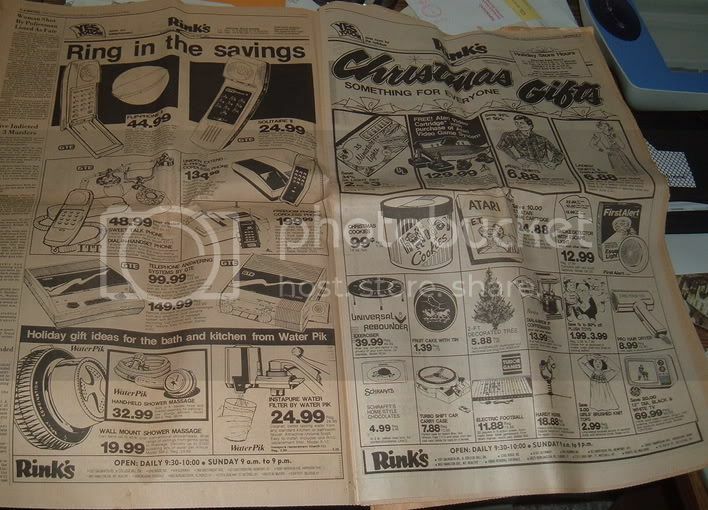 I’ve seen pictures of Rink’s and they look like they could’ve been quite possibly the nastiest store ever. But I could be wrong. 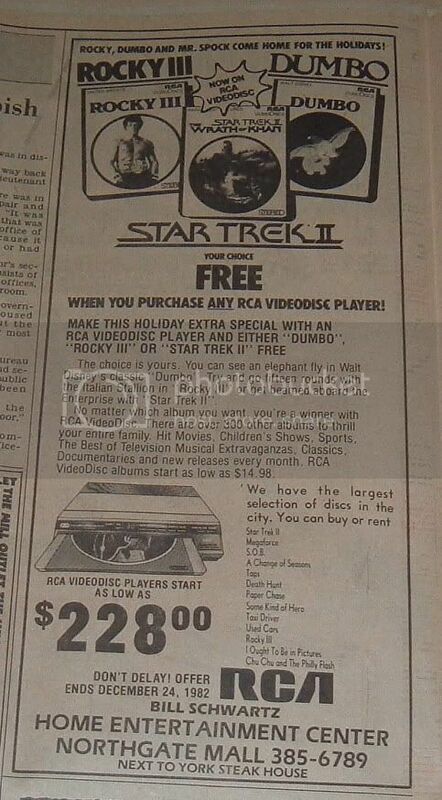 Videodics and videodisc players for sale at Bill Schwartz’s Home Entertainment Center! Northgate Mall in Cincinnati isn’t on deadmalls.comso I guess its alive and well. Yeah, apparently its 90% occupied. McAlpin’s was eaten up by Dillards (along with six kajillion other stores) in the late 1980’s. Make sure to check out the TV set near the bottom of the ad! 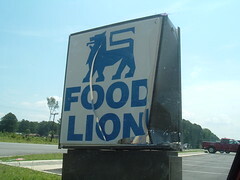 I was leaving Food Lion today in Courtland and I saw this. A few months earlier the stop sign next to this sign was mowed down as well. 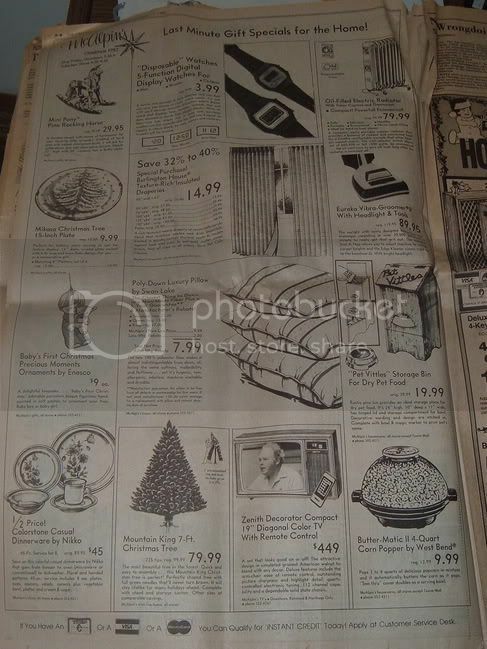 You guys remember last summer when we moved and my dad found those 1983 JC Penney and Sears catalogs my mom saved for me to look at when I got older? Sorry the little boy with his toy hair dryer is on the crease of the page. 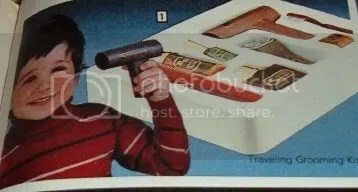 I think the 70’s and the 80’s were the only times that blow dryers were in toy grooming kits. Sweet Christ No! I so remember the page devoted to marionette dolls and “old timey dolls” in the JC Penney and Sears catalogs. I always thought, “No who buys those for their kids?”. I didn’t know any kid who got a Howdy Doody or Bozo doll for Christmas. This must be the “toys for adults page” in the cataloge. 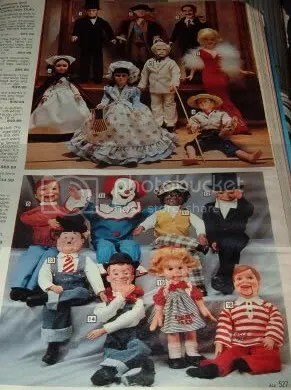 Although I am kinda crushing on the Bozo doll. I wouldn’t mind having one today. Oh yeah, and what’s up with the Huck Finn Doll? I have wanted a Mickey Mouse phone since the beginning of time. They’re always so expensive though. Like almost a hundred bucks. Even at antique stores they’re like $50-$80. The Kermit phone is interesting as well. I still haven’t found a photo of the Olive Oyl phone that I want so badly. When I was five, we’d go to this Salvation Army thirft store and they had a red rotary phone, and Olive Oyl was laying on the cradle. This phone was not for sale. If every family didn’t get these in the 1980’s then they shure did in the 1990’s. 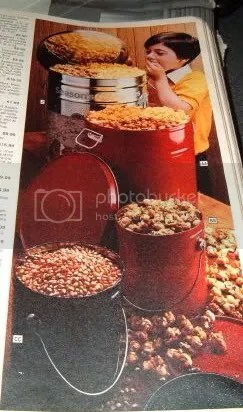 Almost every year I would always get a popcorn tin from mom. I threw out all the other ones but kept a Peanuts one that I keep my old newspaper clippings in. 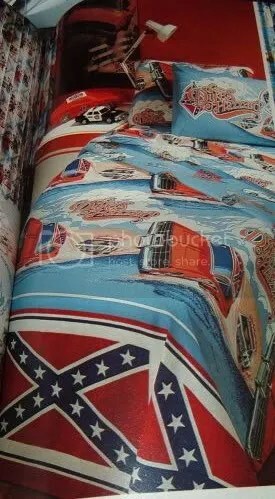 Of all the promo crap they made for the remake movie last year, I wonder why they didn’t make a kiddie bedspread set. We lived in Wakefield (the town past Ivor) for 5 years but never once did I have the balls to go in here. The place probably closed because it was so filthy! Or they finally wern’t making money. 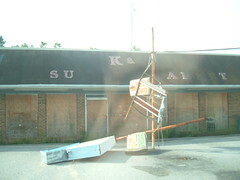 Yeah, I think that sign collasped in the recent storms we’ve been having.